The Sweet Valley Chamber of Commerce is hosting a beauty pageant for girls ages 15-18 as part of a fundraiser for a new community pool. Just go with it. It’s going to be hosted in the Sweet Valley High auditorium, and Jessica is stoked to participate, because she knows she’ll win. Elizabeth is horrified at the concept of the pageant because she believes they’re sexist, outdated, and bring women back. 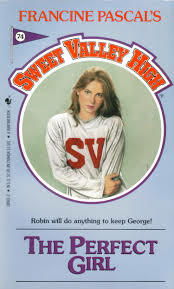 So she decides to stage a protest in hopes of changing the minds of Sweet Valley officials. Jessica is horrified that Elizabeth would do this, so the two girls end up fighting a lot and not speaking to one another for most of the book. Meanwhile, Jessica gets serious about the competition. She hopes to attract the attention of Steven’s college buddy Frazer McConnell, who so far has been completely uninterested in her. She also loves the idea of winning–and the rumors about the increasingly extravagant prizes for the winners doesn’t seem to hurt her desire, either. People at school keep talking about the prizes, and the winning amount keeps going up–like up to $10,000, which Jessica thinks will buy her a car. But she doesn’t consider for a second that giving away that kind of prize money would completely negate the fact that this is a charity fundraiser? Whatever. Liz is determined to bring the pageant to a grinding halt. She enlists the help of her friends to sign a petition and even goes to the mall to collect signatures and hand out flyers. The group protests in front of the Chamber of Commerce and continues to fight the good fight, much to Jessica’s dismay. As determined as Liz is, Jessica also has a lot of drive and resolve. She figures her biggest competition is not Amy Sutton, who is going to twirl her baton as a talent, but Maggie Simmons, a talented actress at SVH, and Sharon Jefferson, a deaf pianist. Okay. So Jessica decides to take some dance lessons to brush up on her skills. With the help of a loan from her mother, she’s able to pay for lessons with Mr. Krezenski, who is actually kind of awesome throughout the book. He’s hard on her but tells her she has enormous potential, which helps push her even further towards her goal. Right before the night of the pageant, Liz discovers a loophole in the SVH bylaws or something. The school can’t host an event that is for-profit (it’s not really, though) without the express permission of the school’s superintendent who has been out of the country all this time. But before she brings this evidence to Mr. Cooper, she talks to Jessica, who tells her about how hard she’s been working, and Liz’s resolve crumbles. She doesn’t say anything, and the show goes on. During Jessica’s dance number, she trips and falls, but gets back up and finishes. She’s humiliated, though, and rushes backstage to pack her things and leave halfway through the competition. Liz goes to try to talk her into staying, but Jessica refuses. So Liz puts on Jess’s swimsuit and does probably the grossest twin switch the series has seen yet (but we aren’t at the Secret Diaries yet, so whatever). Then Jessica ends up rejoining the evening in her dress, and wins the competition! Hooray! The book ends with Frazer McConnell finally asking Jessica out. 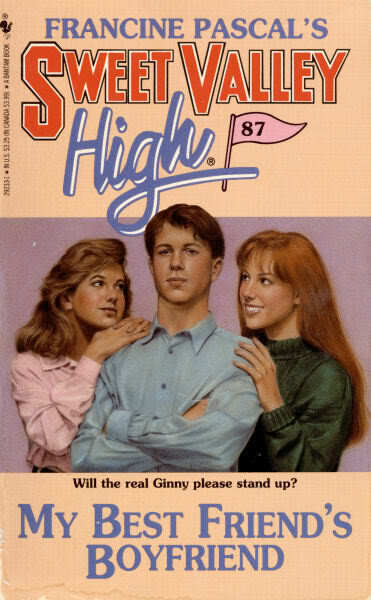 Like this was going to end any other way–we already have our ambiguously gay dude in Sweet Valley. Jessica’s perfect pageant dress is a pale pink chiffon number with a full skirt and stitched pearls on the bodice. Cara has a cousin named Barbara, and apparently she’s pretty hot. The school district’s superintendent has been away in the Soviet Union to meet with educators there. WHY, though? I see both sides of the argument here, but Elizabeth’s argument is a lot stronger. Beauty pageants are totally sexist, totally outdated, and totally ridiculous. But that’s just it: they’re ridiculous. For the most part, people don’t take them seriously, which is probably why Elizabeth has so much trouble drumming up strong support for her cause: NO ONE CARES. That being said, I think it’s super, super weird that this event attracted underage girls to parade around in their bathing suits and no one batted an eye. That doesn’t raise red flags for anyone? Really?